The Australian representation at this year’s Rok International Cup will be decided this weekend in Melbourne, with every Vortex powered category in the Australian Kart Championship still up for grabs. 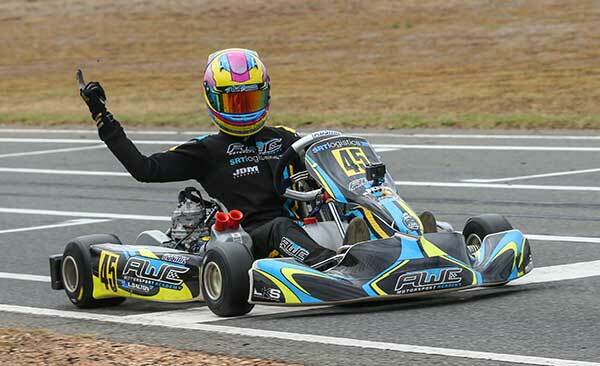 Four drivers – the winners of Vortex DVS-SV KA1 and Vortex DVS KA2 Junior and the top two in Cadet 12 – will earn their right to represent Australia at the international event at the end of October. The race for the Vortex DVS-SV-powered KA1 category took a dramatic twist last week. Unbeknownst to some competitors at the previous round, they were using a fuel that had anomalies which placed it outside of the legal specifications permitted. This affected defending Champion and Round Winner Scott Sorensen, who was excluded from the results, handing the win to round one winner, Lachie Dalton and relegating Sorensen to fourth on the points standings. Dalton heads to Todd Road with a 29 point advantage over last year’s Vortex DVS KA2 Junior Champion, Broc Feeney. With a maximum of 75 points up for grabs should a driver clean sweep the weekend, Joshua Denton remains in mathematical contention – as does Sorensen – who enters this weekend 48 points from the Championship lead. The Junior KA2 Vortex DVS category has five drivers in the hunt for the Title with Kai Allen leading by 23 points. Remarkably, Allen hasn’t won a round of the Championship but has maintained a Championship lead from the second round of the Title chase through maximising his point score throughout the weekend. Drivers score points for Pole Position and throughout each heat race as well as the final. He will have third round winner Kosmic’s Jaiden Pope, the equally consistent JC Kart driver, Jai Brown, last round winner AWC Motorsport Academy’s Jay Hanson and OKC Junior European regular, James Wharton snapping at his heels. Cadet 12 promises to be one for the history books with no less than eight drivers from the 51 that have entered in with a chance at winning the Title and one of the two places to the Rok International Cup up for grabs. Round three winner, Jimmy Pisczyk holds a 13 point advantage over local Victorian Harry Arnett. Marcos Flack is third on the points lineup and will be keen to fight back from his disqualification at the last round. Also in the mix are Max Deguara – who has tasted the podium on occasion this year, Alex Ninovic – who has had form but has yet to crack it for a round win, last round winner Carter Mobbs, Joe Fawcett and Jesse Lacey – who is making a comeback after a big crash at a recent Rotax Pro Tour event. Cadet 9 sees Kart Republic racer, Justin Francis sitting at the top of the tree with 47 points up his sleeve with fellow Victorian Peter Bouzinelos hoping home track knowledge will assist his challenge, while last round winner, Rock Han from South Australia sits third, 65 points from the Title lead.